Business value of new applications. Size and complexity of software products. Business domains can be measured by the number of entities weighted by complexity (taxonomies and dependencies). Business processes can be measured by the number of transactions weighted by the complexity of execution paths (extension points and dependencies). Metrics of system functionalities are set along two axes: the first one is defined by their business footprint, i.e entities and transactions supported by the system (as defined by use cases); the second one deal with the nature of system boundaries for users, events, or devices. Functional measurements must be adjusted for transverse (aka non functional) requirements, i.e operational or regulatory constraints that cannot be allocated to any specific business requirements. Estimates for development costs will take into account technical and human resources as well as organizational contexts and constraints. Return on investment (ROI), based on business value and costs. Business processes assessment, based on business value and systems functionalities. Engineering processes assessment, based on systems functionalities and development costs. Since projects begin with requirements, decisions about targeted functionalities and resources commitments are necessarily based upon estimations made at inception. Yet at such an early stage little may be known about the size and complexity of the components to be developed, hence the importance of the distinction between business requirements (domains and processes) and systems supporting functionalities (represented by use cases). A skeleton is footprint is built from directly identified (aka primary) objects and activities, and the associated partitions (objects classifications or activities variants). Objects and activities identified through primary objects are the added to the skeleton. The symbolic representations of primary and secondary objects and activities are fleshed out with features (attributes or operations) defined within semantic domains. Average number of artifacts and partitions by domain. Total number of secondary objects and activities relative to primary ones. Average and maximum depth of secondary identification. Total number of features (attributes and operations) relative to number of artifacts. Ratio of local features (defined at artifact level) relative to shared (defined at domain level) ones. Total number of activity variants relative to object classifications. Total number of exclusive partitions relative to primary artifacts, respectively for objects and activities. Percentage of activity variants combined with object classifications. Average and maximum depth of cross partitions. It must be noted that whereas those ratios do not depend of any modeling method, they can nonetheless be used to assess requirements or refactor them according to specific methods, patterns, or practices. Functional size measurement is the corner-stone of software economics, from portfolio management to project planning, bench-marking, and ROI assessment. And since software has no physical dimension, relevant metrics can only be based on the expected functionalities of supporting systems. 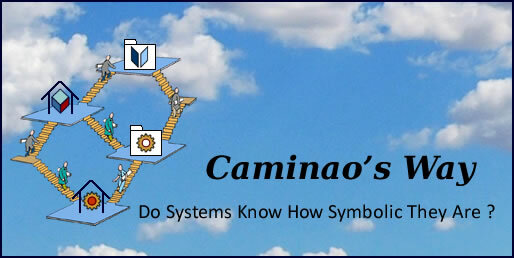 Mixed inputs: business contents, system functionalities, general systems characteristics. Mixed procedures: objective tally, subjective guesses, and statistical regression. Problems assessment should be aligned with requirements taxonomy: business, functional, or non functional. Solutions assessment should distinguish between the problems at hand (business or supporting functionalities), and development resources and strategies. Interactions with users, identified by primary roles and weighted by activities and flows (a). Access to business (aka persistent) objects, weighted by complexity and features (b). Control of execution, weighted by variants and couplings (c). Processing of objects, weighted by variants and features (d). Processing of actual (analog) events, weighted by features (e). 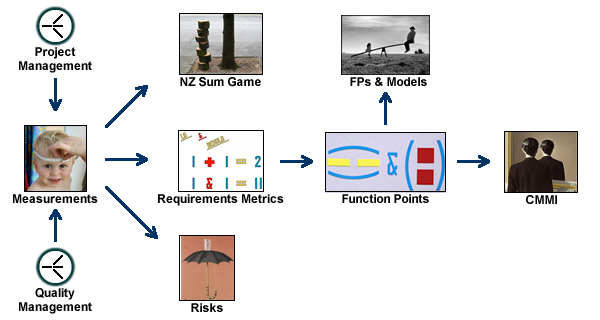 Processing of physical objects, weighted by features (f). Assessments based on intrinsic metrics (business logic and supporting functionalities) are then to be adjusted for usage, operational, and technical constraints. The fuzziness of initial guesses is increased by guesses about general characteristics. Those “general” characteristics lump together different kinds of concerns: business (e.g complex processing), functional (e.g end-user efficiency), operational (distributed locations, maintainability), or development effort (e.g reusability). The remedy to those drawbacks is to chart system characteristics according requirements taxonomy. Operational and quality of service requirements relate to the way supporting systems are operated and used, independently of specific business contents. Technical requirements relate to the way supporting systems are implemented, assuming other requirements are satisfied. Assuming moreover that technical requirements are set independently of operational and quality of service requirements, they should not be taken into account for functional adjustment. That’s not always the case for constraints on quality of service and operations as they may entail some arbitrage against functionalities, as illustrated by ease of use, security, response time, compliance, etc. In order to sort out adjustment factors, those constraints will have to be examined depending on their target. 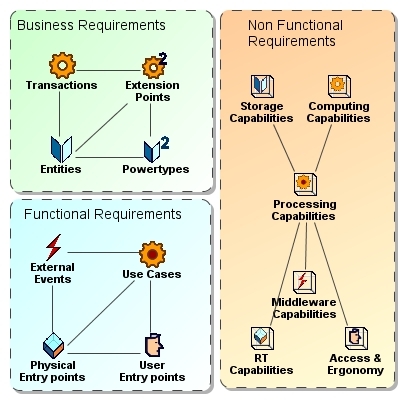 Functional requirements targeting identified artifacts in business domains, activities, and users’ transactions can be directly measured using function points (respectively DFP, AFP, and UCFP). Constraints (aka non functional requirements) targeting specific domains (e.g privacy) or activities (e.g transaction rate) should be either incorporated into primary function points (when translated into adjusted functionalities), or ignored (when taken care of at operational level). Operational requirements are set at enterprise level but are meant to be supported by technical architectures. As a consequence the corresponding adjustment factors should not be introduced until development effort is considered. Story points, which mix business and functional requirements as understood from users stories. Actual development outcome, updated dynamically according to metrics computed on iterations and backlog, e.g burndown and velocity. Given that such metrics essentially depend on heuristics and experience, agile development processes will have to be assessed within a broader framework. Initial: No process. Each project is managed on an ad hoc basis. Managed: Processes are specific to projects. Defined: Processes are set for the whole organization and shared across projects. Measured: Processes are measured and controlled. Optimized: Processes are assessed and improved. Traceability: from requirements to deliverables (products), work units (projects), and tasks (processes). Measurements: functional (products), effort (projects), performance (processes). Quality: verification & validation (products), tests plan and risks management (projects), quality assurance (processes). Reuse: artifacts and patterns (products), profiles (projects), organization (processes). Management: model driven engineering (products), planning and monitoring (projects), maturity assessment (processes). Whatever the volume of data and the statistical tools employed, the whole of the process assessment pyramid clearly depends on the measurements of processes outcomes and their traceability to organizational alternatives.